McKenzie Johnson graduated from Vassar College with honors in 2004 where she majored in Environmental Studies with a minor in Biology. McKenzie received an M.A. in Conservation Biology from Columbia University (2005-2007). After graduating from Columbia, McKenzie took a position as the Wildlife Trade and Program of Work Protected Areas Manager for the Wildlife Conservation Society in Kabul, Afghanistan. She worked with the Government of the Islamic Republic of Afghanistan from 2007-2010 to develop conservation policy. 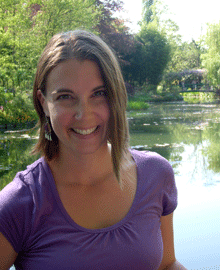 McKenzie began her Ph.D. in Environmental Politics (advised by Dr. Erika Weinthal) at Duke in 2011. Her research focuses on the role of natural resources in post-conflict peacebuilding in Sierra Leone and Afghanistan. McKenzie will spend this summer conducting interviews with the United Nations Environment Programme Disasters and Conflict branch in Geneva as part of her dissertation. The purpose of this research is to better understand how international institutions impact natural resource management as it relates to post-conflict peace building. Check back for updates in mid-July.